Here is the notice about the rally that the AWA sent to its members. The Castle Wilderness Area is at risk. These past 8 days, our colleagues with the Castle Crown Wilderness Coalition and the folks of Beaver Mines who have formed the group Stop Castle Logging, have held a media conference and have been taking turns manning a camp at the site where Alberta SRD and Crowsnest Forest Products Ltd, a subsidiary of Spray Lakes Sawmills Ltd, plan to begin logging. Their tenacity and strength as they were served with a Notice of Development by Alberta SRD yesterday is something they do for the greater good – for the protection of our forests, for the reasonable demand that we consider years old forest logging plans out of date; to show that as Albertans we want new and better science about managing forests implemented. We want our forests managed not primarily for timber but for their vital ecological values, including the water security of downstream communities. There has been significant work by all Alberta conservation groups on this issue from Waterton to Kakwa, and we all share in the message from the folks on the front line of the Castle. This is not just a local issue. We know the way our Alberta forests are managed must change. Clean, abundant drinking water, habitat for wildlife, and sustainable recreation opportunities depend on that change. Despite significant evidence from public opinion polls that Albertans want the Castle area protected, likely thousands of calls and letters since September 2011 to our Premier opposing the way forests are managed and seeking protection for the Castle Wilderness, and the science that shows us we need to update our forest management practices, the response from our government has been a “Notice of Development ” order served yesterday by Blairmore Alberta SRD officer Cory Wojtowicz, warning our colleagues they are trespassing. On Sunday January, 22nd at 2pm, there will be a rally just inside the Castle Special Management Gate, approximately 9 km southwest of Beaver Mines on Hwy 774 (49.414973 N, 114.269839 W). Off-highway parking will be available along Range Road 30A, just outside the Castle gate. (This location is outside the area closed by SRD, and has safe, off-highway parking.) I am writing today to invite you to attend the rally, and if you cannot be there, to consider inviting someone you know to go. 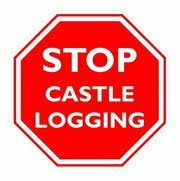 More details can be found at stopcastlelogging.org. This entry was posted on Friday, January 20th, 2012 at 8:01 pm and is filed under Uncategorized. You can follow any responses to this entry through the RSS 2.0 feed. You can leave a response, or trackback from your own site.